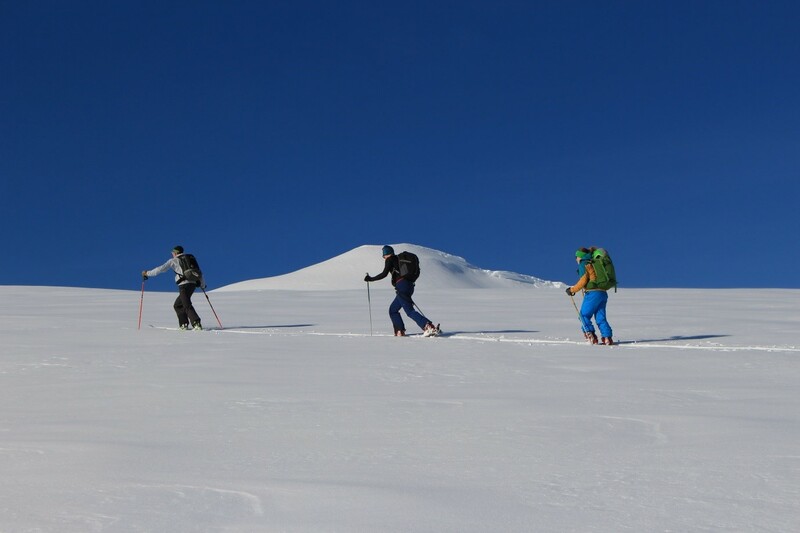 Exercise Dragon – Arctic Heights was a ski mountaineering expedition run by Cambridge University Officers’ Training Corps, exploring Norway’s remote Lyngen Alps. These sheer mountains rise from the Arctic Ocean at the North Norwegian coast, forming a steep sided peninsula flanked on either side by open water. Lyngen is one of Norway’s least populous regions; a single town and a few isolated hamlets cling to the mountains, perched above the sea. Winters here are long, and rich in snowfall from the saturated ocean air. Because the mountains are deep inside the Arctic Circle, too, conditions at sea level mimic those at the very highest altitudes in the Alps, creating stunning skiing from the summits to the shore. 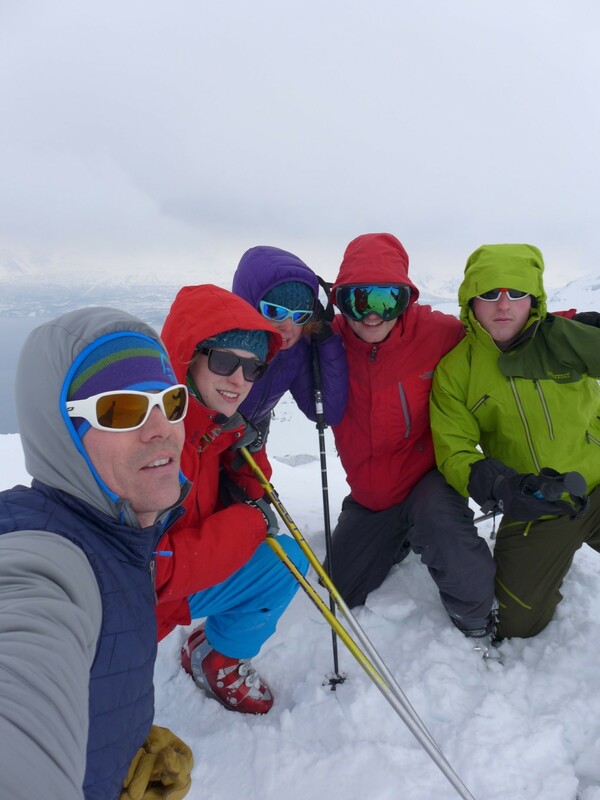 The team of Cambridge officer cadets that travelled out to Lyngen were skiers of some experience, but all were new to the demands of ski touring. Thus the first challenge was to pick up the skills, like skinning (skiing uphill, gripping with a “skin” attached to the bottom of the ski), route finding, avalanche rescue and much more besides, that would enable us to conquer the peaks and access their legendary descents. For this we turned to Ski Mountaineering Instructor Sgt Rob Brown, veteran of Bavaria’s Alpine Training Centre and expert in all things winter. 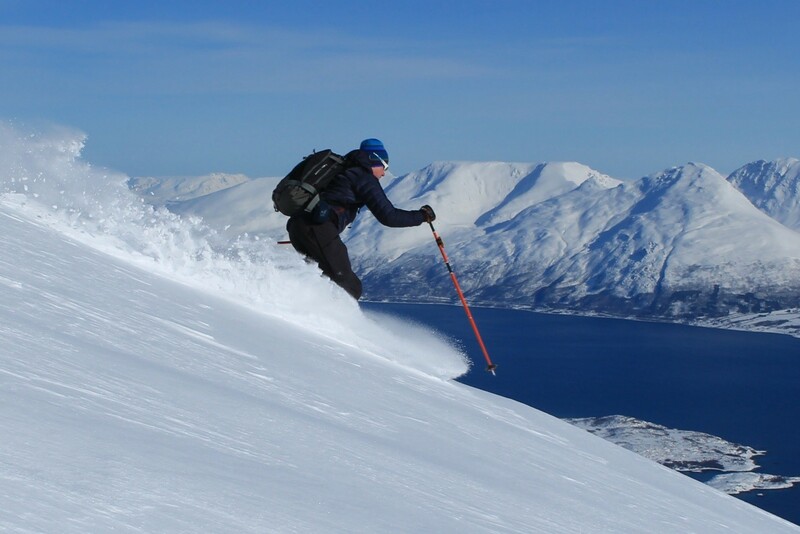 Rob took us through a patient programme of day tours, gradually introducing new techniques and capping some of Lyngen’s smaller peaks along the way. 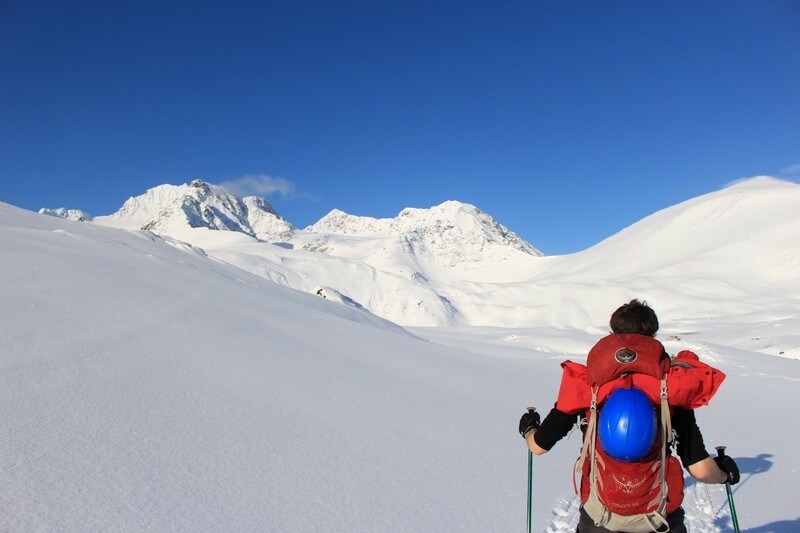 Once the team had gained competence and confidence in the basics of ski touring, it was time to take on some of the peninsula’s more meaty challenges. Skiing from sea level in an area without lifts brings its own difficulties – unlike in the Alps, every vertical metre of descent must be climbed first, every turn earned. So tackling mountains in excess of 1500m high, starting from the beach, was physically demanding work. The upside of this, though, was the immense reward of the downhill, and it is this contrast between slow, steady climbing and swooping descent that makes ski touring so appealing. Nowhere was this more apparent to our group than on Daltinden. Standing in the shadow of Jiehkkevarri, Lyngen’s highest mountain, but no less imposing at 1533m, it gave us the biggest day of the trip, both in terms of mileage and vertical distance. The approach to Daltinden’s North couloir is up a long river valley, crossing back and forth over the stream on the thick ice and snow bridges formed above its surface. Eventually leaving the stream, one is confronted with the mountain’s daunting North face, an almost unbroken 30° slope rising one and a half vertical kilometres. It was a hard slog up. Sweating even in the freezing temperatures, we slowly skinned, kick-turned and grunted our way up the hill. Standing on the top, for those few precious moments before wind chill and numbness drove us off again, the hard work and hunger melted into sun, sea, and snow-capped perfection, the staggering beauty only mountaineers know. This is why we climb. Skiing down the hill is a bonus. But what a magnificent bonus. Daltinden’s North couloir is a broad, open valley, catching just enough cross-blown snow to give us a beautiful powder descent, smooth and flowing for every one of the metres we had climbed. The rest of the two week expedition continued in much the same vein. We managed to summit many of the touring peaks on the Lyngen peninsula, as well as some across the fjords. Sometimes we weren’t so lucky; storms blow up quickly in the Arctic, and on several occasions high winds and poor visibility meant we had to abandon summit attempts. These experiences provided a true test, taking expedition members well outside their comfort zones, and forcing them to make good decisions under a high degree of pressure and discomfort. Exercise Dragon – Arctic Heights was an extremely valuable experience for all concerned. As well as being physically tough, the expedition had serious elements of mental challenge, and made everyone confront difficult situations. The team has benefited from this in terms of character and in terms of skills and experience gained – several members intend to take this on towards instructor qualifications. We also hope this expedition might add to the diversity of Army adventure training. This was the first Forces expedition to Lyngen; we hope it will encourage others to visit this truly special place.